If you are pregnant, it is a good idea to add more super-healthy artichokes to your diet. You can cook them whole and slip each leaf petal through your teeth to reveal the delicious heart. Or you can use them in stir-fries, pasta dishes and dips. Low in calories, fat, sugar and sodium and high in fiber and important nutrients, artichokes are good for you and your growing baby. Originally from the Mediterranean, the fern-like artichoke plant is a member of the sunflower family. The green globe is common among the many varieties of artichoke. The edible portion is the plant's flower bud, the largest of which is produced at the end of the long central stem. Choline in the diet during pregnancy is essential for healthy brain cell development. The recommended daily allowance of choline for pregnant women is 450 milligrams, and one artichoke supplies 41 milligrams. Choline may help your baby with long-lasting effects on the ability to learn and remember. According to the BabyCenter website, researchers have found that choline may provide some resistance to mental illness in addition to protecting your newborn against neural tube defects. Choline may also reduce the risk of breast cancer by lowering levels of the amino acid homocysteine. Excessive homocysteine in the blood may cause heart disease, cancer and cognitive decline. One on the most important nutrients to include in a pregnancy diet is folate. During pregnancy, folate is essential for the continuous production, growth and development of new cells. One artichoke provides 107 micrograms of folate toward the total recommendation of 400 micrograms daily for pregnant women. Folate is best known for its effect in preventing spina bifida and neural tube defects. It also helps protect your baby from deformities in the skull and brain. Insufficient folate may result in low birth weight or premature birth. Unfortunately, constipation causing abdominal pain and difficult bowel movements affects almost half of all women sometime during pregnancy. This may be the result of hormones that relax the intestinal muscle and from the growing uterus putting pressure on the intestines. Eating an artichoke provides more than 10 grams of fiber, which is 40 percent of the amount recommended by the National Academy of Sciences’ Institute of Medicine. During pregnancy, the need for magnesium increases because the baby draws on the mother’s supply for tissue growth. Magnesium is passed to the baby through breast milk, so it’s important to eat a diet containing sufficient amounts. Low magnesium levels may cause fluid retention, leg cramps and restless legs during pregnancy. 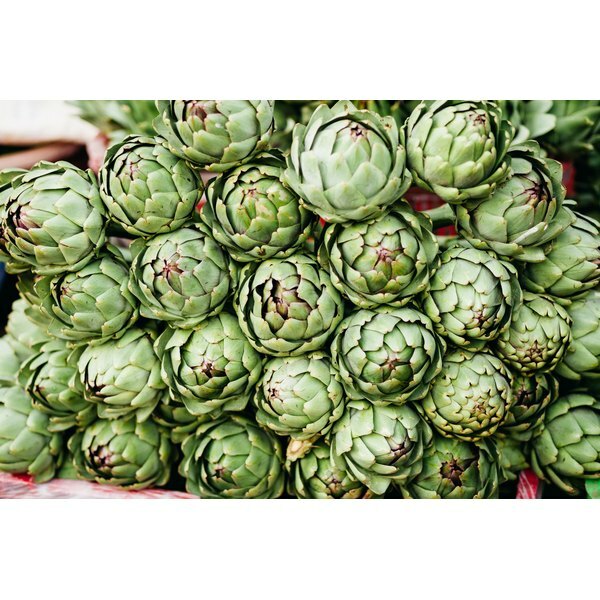 Artichokes are an excellent source of magnesium, each providing 50 milligrams toward the RDA of 250 to 300 milligrams. During pregnancy, you should limit your intake of fat to 30 percent or less of your total daily calories, or 65 grams for a 2,000-calorie diet. Cholesterol intake should not exceed 300 milligrams per day, recommends Cleveland Clinic. Artichoke is low in fat and cholesterol-free, so you won’t consume unnecessary calories that could cause excessive weight gain and a strain on your heart. How Does Poor Circulation Affect the Eyes? Can You Eat Peas on a Diet?